Looking at my dashboard the other day I realized that there are some majorly creative people on Blogspot. It's not just when it comes to painting and drawing either. We are followers of some very impressive people when it comes to fashion, home decorating, cooking, and nail designs. I admit that I am not the best when it comes to nail designs or even getting my nails polished. I rarely even have nail polish on. I love it though, all of the pretty colors it comes in. I have looked through the blogs that I have been following and there are several who specialize in nail designs, and when I say specialize I mean they are freaky talented and amazingly creative. I have fallen in love with some of their designs and just have to share them with the rest of you, encase their brilliantness has escaped your attention. 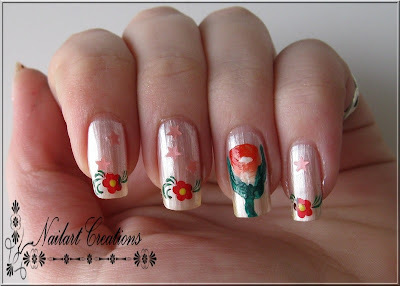 This beautiful nail design comes from Jacie at the blog You've Got Nail. This is a Nail Rock design and Jacie calls it Black Lace on White. I love how feminine the design is, but is seems so edgy because it is black and white. If you click HERE, you will be taken directly to Jacie's blog post on how she created this look. It even includes a youtube video! This beautiful nail design comes from Jen's blog The PolishAholic. This look is so adorable and I love the colors she choose to use. If you want the details on how Jen made this happen just click HERE. I love these beautiful orange flowers in this nail design by Sylvia at the blog Nailart Creations. I think this is a more cheerful, playful design. If you want to know how Sylvia created this click HERE. Sylvia also has a post about a nail design she created that was inspired by a painting by Dutch painter Piet Mondriaan and if you would like to check that out click here. 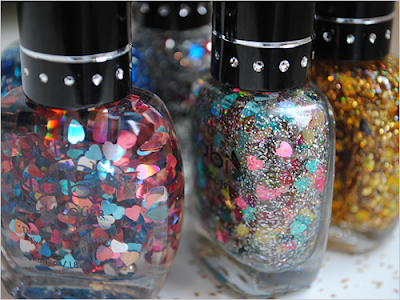 This nail design was created by Alexa at the blog Addicted to Konad. I love this starry design and am impressed with how easy Alexa makes it look. If you want to know how Alexa did this click HERE. 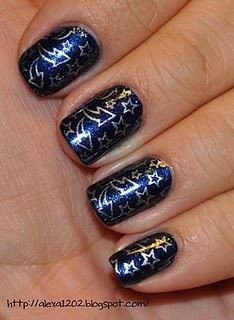 This shooting star design was created by Cyan at the blog Blue Tape and Nail Tips. I love looking at Cyan's nail designs, because the only tool other than her nail supplies that she uses is blue tape. I am so impressed with the designs that she comes up with. If you would like to check out this one click HERE. I can barely paint my nails and make it look good, so I can't help but be impressed with all of the designs that these ladies come up with. They make them look so easy and they give the best instructions. I am going to have give these five a try soon. those are amazing. The make press and stick nail design now. All you do it put the sticker on and then file the extra off. Wow! I will have to have a look at some of these blogs! Amazing! Ahw that's so sweet! Thank you girl! Love all the other designs too :)! Thanks for including me! I'm glad you liked mine, I'm not too hot at nail art either but every now and then it works out!